This month marks the 15th anniversary of my first ABBA website, The ABBA Phenomenon in Australia. For as long as I’d been an ABBA fan I had been recording the details of ABBA’s career in Australia, collecting all the local pressings of ABBA records, as many articles and as much information as I could find. In the early ’90s a local record collectors’ magazine published an article about ABBA’s Australian discography. It contained many errors, with record releases based on dates that records entered the top 40 singles chart (based on a book detailing the charts in the state of New South Wales only, not nationally). A few singles released in 1974 and 1975 entered the top 40 during 1976 after ABBA’s visit in March that year – the article gave the impression the singles were released then. Slightly outraged at the many inaccuracies I wrote a letter to the magazine listing corrections, including a full Australian discography. This sparked the germ of an idea to write a book about ABBA’s Australian experience (an idea that sill sits in the back of my mind). I used the letter was the basis to write a longer history of ABBA in Australia, that then was filed away with my ABBA cuttings. In 1996 we got our first home computer and connected to the internet. Seeing other fans create their own ABBA websites inspired me to create my own, and the ABBA in Australia idea seemed an obvious thing to do. A lot of fans had questions about that period of ABBA history, and many published biographies had a lot of incorrect information, mostly based on earlier inaccurate or incomplete information. I got website creating software, got all my information together, and on 17 July 1997 The ABBA Phenomenon in Australia was born. It’s not the catchiest title, but obvious names like ABBAMANIA had already been used. The ABBA Phenomenon had been the local title of the 1977 book ABBA By ABBA (original Swedish title: Fenomenet ABBA), so that was an inspiration. To this day I try to keep it up-to-date with all the latest ABBA information. Last weekend we headed out west for the inaugural Trundle ABBA Festival, at Trundle in central New South Wales (Australia). Trundle is a small town, about 350 km west of Sydney, with a population of 666 (according to the 2011 census). Like many small country towns it is trying to thrive in a modern world. Earlier this year it was subject to the ABC TV series Country Town Rescue, enticing newcomers to the town. 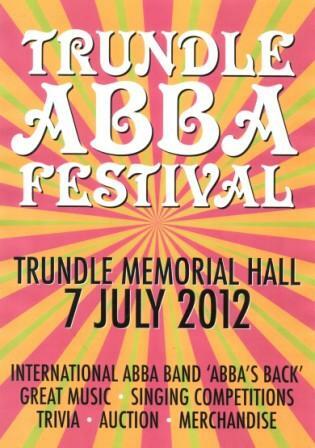 And now to encourage tourists and visitors Trundle is hosting its inaugural ABBA Festival. The Festival was spread over three venues – the Trundle Hotel (pub), Memorial Hall and Services Club. Events included a singing competition, a performance by the Parkes Shire Concert Band, best dressed competition, a couple of singalong screenings of Mamma Mia! The Movie, local group Diva 5 performing not ABBA songs, but a set of 60s hits, an ABBA memorabilia auction, climaxing with two sets by tribute band ABBASBACK, finally ending with a disco and karaoke, and a performance by local band Risky Business. People travelled from far and wide; from the nearby area (Parkes, Forbes, Dubbo, Orange and surrounds), plus a few from further abroad (Sydney, Newcastle, Brisbane and Melbourne). I would estimate that there could have been 6 or 7 hundred people attending the Festival – there many have been more though, with three venues (and people breaking out to eat) it was rare for everyone to be at the same place at the same time. Locals were very welcoming of the visitors. There was no Priscilla-esque standoff between country and city folk. Everyone got into the spirit of the occasion, with many people dressing in ABBA-inspired or general ’70s costumes – so many kimonos, cat dresses, flares, high-heeled boots, blonde wigs and blue eyeshadow! Bar staff wore specially made t-shirts, with “I [heart] ABBA” on the front and selected song lyrics on the back. There were a few fun surprise moments. During the Singing competition and the band concert the audience joined in, swaying and singing along. Young Jesse from Wagga Wagga sang ‘When All Is Said And Done’ in the Singing competition accompanied only by her own ukulele. Most memorable was a (near) spontaneous ‘Fernando’ singalong at sunset, around the fire bucket in the pub’s beer garden. Organisers are hoping the ABBA Festival will become an annual event, along the lines of the Elvis Festival in nearby Parkes every January. Judging by the reaction on the day, it’s quite likely that it will be back again next year. Keep an eye on the ABBA Omnibus When section for ABBA events or sign up for the Oz ABBA newsletter to keep up to date with Australian ABBA news. Click on “Read the rest” below for a selection of photos from the Festival.